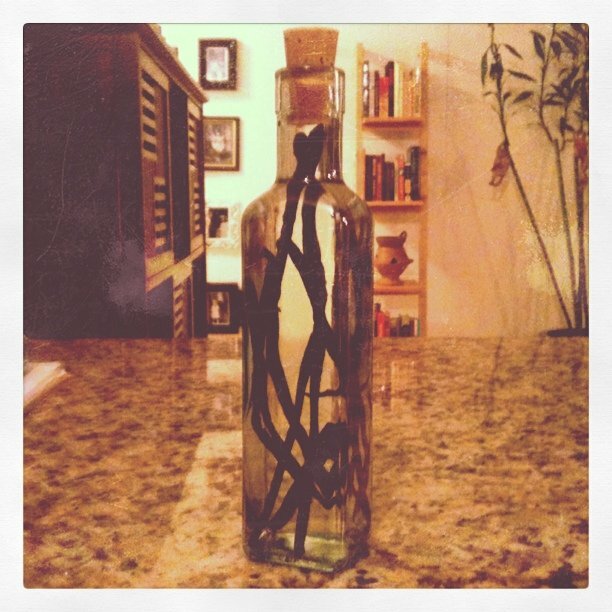 A few years back, I read a piece in Food & Wine about making your own vanilla extract and knew I had to give it a try. Why would someone want to do this? Real vanilla extract is expensive. It’s very self-satisfying and gives you an (admittedly modest) feeling of accomplishment. You can drink the leftover liquor. If you’re not convinced by at least one of the above, we’ll most likely never be friends. This is so, so easy. Buy some whole vanilla beans. I’ve found 5 – 10 works best, depending on the size of your bottle. Put them in a clean glass bottle and cover with vodka or light rum. Cork the bottle and put it in a cool, dark place. Five to six weeks later, you have beautiful, fragrant vanilla extract. UPDATE: Vanilla beans (vainilla en chaucha or ramas de vainilla, depending on who you ask) have been found in Buenos Aires! Check the puesto selling spices at Mercado San Telmo, he was selling them for $14 ARS each. Not bad at all. Anyhow, I’d post a picture of the final product, but somehow didn’t think to document it in all its glory before we had to part ways. When packing one’s life for a move to another hemisphere, a bottle of vanilla extract doesn’t make the cut, even for me. But trust me when I tell you it was a thing of delicious-smelling (and tasting) beauty. Aaaugh, I’m so jealous! Seriously one of my favorite stores ever. Let me know how it turns out!